Owing to India's rapid growth in terms of its push towards digital methods, which in turn has led to a growing demand of digital infrastructure, technology and service provider Bosch has decided to revamp its business model in the country by shifting its focus from just mobility to other demand areas which will benefit from the firm's smart solutions. Some of the major areas where Bosch has already begun contributing towards a digital shift include the construction industry, which benefits from Bosch's connected power tools solutions and rental digital services. The company is also working on transforming the country's security infrastructure by providing technologies such as intelligent cameras and public address systems, which incorporate big data analysis for added robustness. 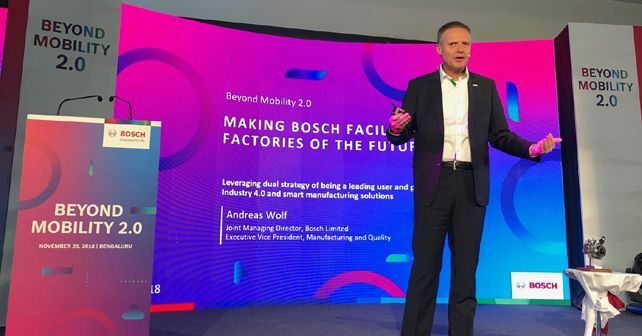 In order to create a smart infrastructure for factories but with reduced energy consumption and long-term sustainability goals in mind, Bosch has introduced something called the Bosch Energy and Building Solutions (BEBS) and it's key beyond mobility solution offering, the 'Industry 4.0' technologies. Not only does BEBS offer services to decrease the energy consumption of commercial and industrial facilities but it also offers solutions for easy monitoring and controlling of energy consumption. With Industry 4.0 technologies, Bosch intends to smart factories with focus on automation, digitalisation, Artificial Intelligence (AI) and IoT in order to boost productivity, quality and safety. At the heart of all these changes, Bosch claims that innovation still remains a crucial factor. Owing to the use of modern-day technology like AI, Blockchain and Bosch's '3S' strategy involving sensors, software and services to develop all these smart solutions, innovation, as per Bosch, still remains at the helm of all their technological pursuits.